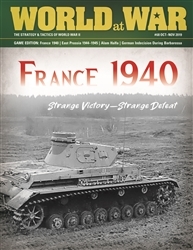 France 1940 is a two player game that allows players to examine the strategic possibilities inherent in the campaign that occurred within France and the Low Countries in that year. 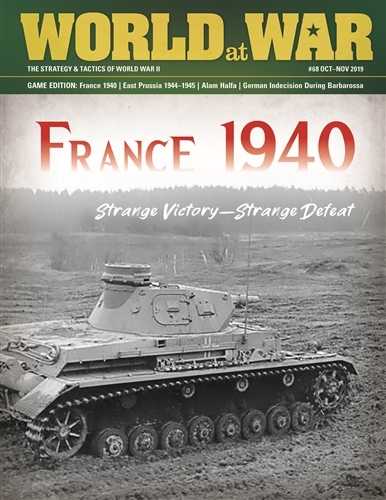 A second scenario allows for an alternative history examination of the opportunity the French had in September 1939 if they had kept their promise to launch a major offensive into Germany within a week after that nation invaded Poland. Each game turn of the 1940 scenario represents 3.5 days. Aside from the West Wall and Maginot Line fortifications, all units in the 1939 scenario are divisions while all units in the 1940 scenario are corps. In the 1939 scenario each turn represents two days and in the 1940 scenario each turn represents 3.5 days. Each hex on the map represents 16 miles (26 km) from side to opposite side.